The relaxed trio. Private Collection. I could find much information about Frank Newell Libby, thanks to his name and birthdate affixed to the back of this 1/6th plate tintype. Frank is sitting front left. Click for larger image. Frank was born October 27, 1858 in Lisbon, Maine. His father was Daniel Blake Libby and his mother was born Joanna Atwood Durgin. Frank also had an older sister by a year, Francis Antoinette. He was already a 6th generation native, his ancestors first arriving in Maine in the early 1600s from Kent, England. He married Florence A. Harvey on the 26 of August 1884 at the age of 25. Florence was 20. He had his first son, Harold, with her six month later *cough cough*, promptly followed by 6 others: Gladys, Iva, Iona, Marion, Erland (who passed at 8 months old), and his last, Howard, in 1901. He’s wearing a wedding ring on this tintype so I estimate it was taken around the early 1890s at the latest. He spent most of his life in Auburn, Maine and lived to be an old man. He passed away on November 27, 1929 at the age of 71. A very relaxed pose and a smile that is unusual for the time. You find more of those later from the 1910s on. Of course, they’re all holding a cigar in their hand, that was not unusual! He looks like he was amused and was saying something. His friend to the right who’s looking off has this expression like he’s about to smile. The one in the middle has a very intense look in his eyes. All in all, one of the top two favorite tintypes in my collection, the other being this one. He’s most likely wearing shoes he made himself! After a stint working as a meat cutter at a grocery store, Frank turned to shoemaking like his father, and one of his sons followed on in his footsteps -pun intended. The double buckle shoe is unique and very, very nice! A good thing his shoes show because the other two’s don’t! Also note he’s wearing creased pants. Like I said in another post, those only became more popular a good decade and a half after this tintype was taken. They were expensive to maintain until synthetic fabric came along after the first World War, so Frank was dressed to the nines. Well, there you have it! I love it when I find so much info about a person! His (incomplete) Find a Grave I was glad to add his picture to. 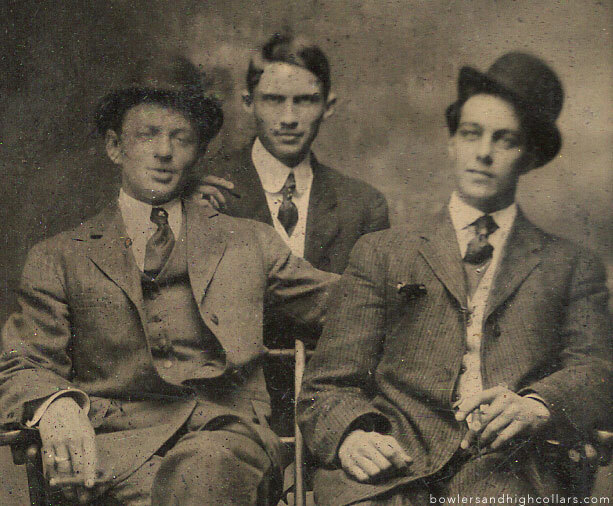 This entry was posted on Friday, March 27th, 2015 at 10:30 am	and tagged with 1/6th plate, 1880s-1890s, bowler, fashion, handsome man, Maine, relaxed pose, shoes, smiling, USA, victorian and posted in Groups, Tintypes. You can follow any responses to this entry through the RSS 2.0 feed. Yes, those would do well today too!